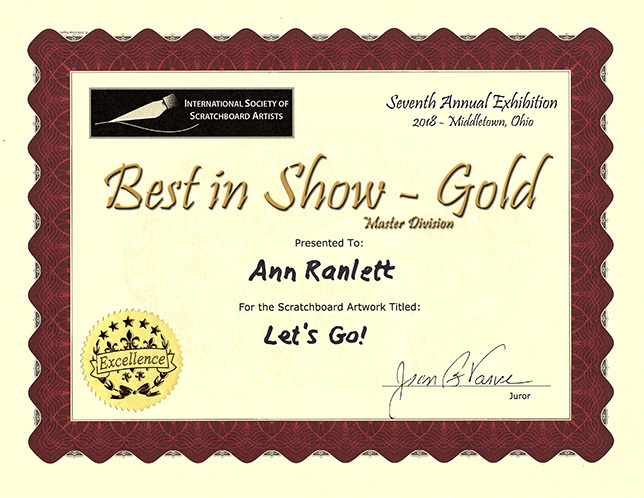 It was a surprise and an honor to learn at the opening reception that “Let’s Go!” a scratchboard drawing of my friend’s dog, Fidget, received the Best in Show (Gold) Award in the Master’s (MSA) Division of the 2018 International Society of Scratchboard Artists‘ Annual Exhibition. The juror for the MSA Division, Jean Vance, had this to say about the drawing after I wrote to thank her for choosing my work for the Gold Award: “When I walked into the gallery, I immediately was captured by your entry; the composition, values and fine detail that exemplified the beauty and technique of scratchboard. 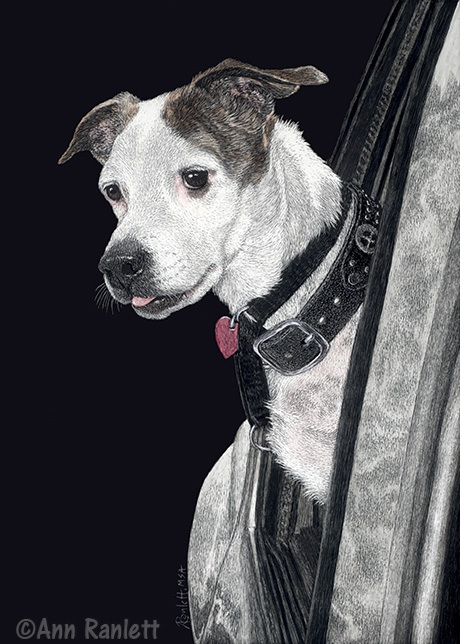 You are correct in saying that any in the Master’s division could have been considered, but yours spoke the loudest and spoke to me of joy.” I am truly grateful that she saw something special in this work, as the subject is a very special dog. Fidget was a senior dog with cancer when my friend adopted her, yet she thrived and is still going strong (although slowing down now) nearly 5 years later. The Best in Show Award belongs to Fidget as well!